I grew up in the temple town of Tuljapur, in rural Maharashtra, in the late 80s and early 90s. Like the rest of the nation, we were all cricket-crazy kids and like most of the village folks, we were from the lower middle class and poor families. If you joined the game having your own bat, you were accorded many privileges, including choosing your batting position (mostly opening). It also meant that you could contest any decision that went against you. More often than not the games ended when the patience of the other kids gave out, and you threw a tantrum at finally being given out, and walked away from the game carrying your precious bat. Reading the reactions of many liberals and intellectuals about the Brexit referendum results yesterday reminded me of those games played in my village, and the tantrums that we the bat owners threw. There are two differences, however: one, we were ten- and twelve-year-old children, and two, at least we owned bats. In my first widely-read article, “I am left and you are wrong”, I had argued that liberals often use disagreement with their point of view as a proof of your moral deficiency. With the Brexit results, liberals have taken this one step further and begun suggesting measures that alarmed me enough to write this article. If you have been following social media, then you would know that those who label themselves liberals did not take this defeat and the UK’s decision to leave the EU kindly. Their reactions ranged from sarcasm to outrage but the underlying attitude/belief was the same: “It is dangerous to let common people decide what they want. Better leave these matters in the hands of educated people like us”. 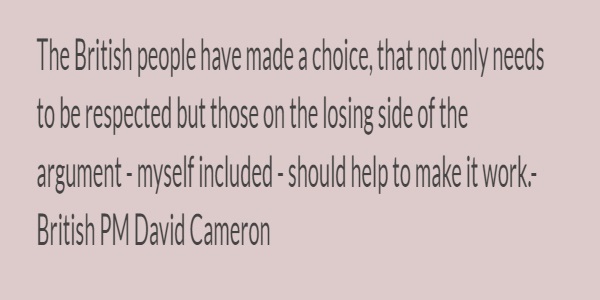 It is not my purpose in this article to discuss the wisdom behind David Cameron’s decision to call for a referendum on this matter, and whether the people chose correctly or not. It is the timing of these comments that bother me more than the content. If liberals thought referendum was not the way to proceed in this matter, they should have fought it tooth and nail, rather than taking part in the process (or supporting those who took part) and blaming the system! Railing against those who sought to quit and screaming insults when the result went against you speaks of the worst excesses of the cry-bully culture of the left. As you can see, there are several things wrong with it and I am too tired to be angry about it by now. So, let me just list them. To start with, the interpretation that the older generation threw the younger generation under the bus is one-sided and bigoted. It fails to take into consideration that younger people may be more easily swayed by propaganda (especially through social media) and hence they bought into the ‘Remain’ lobby’s peace-and-unity rhetoric compared to the response by older people who have seen and experienced the EU-induced reality for decades. The ‘Remain’ lobby progressively lost support among the older citizens/voters. It also meant that people who lived as adults longer in the EU were more disappointed with the EU reign compared to the young voters who have little memory or experience of this reign, let alone how life was prior to the UK joining the EU. Our parents often protect us from the many harsh realities of the world, and so is it too big a stretch of the imagination that the ‘Remain’ lobby targeted voters who were least likely to have any experience with that reality? 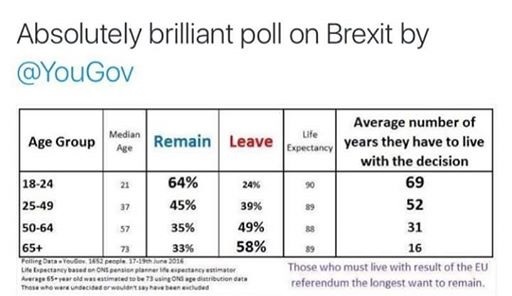 The bigger problem with this piece of statistics is of course the underlying expectation that the right of self-determination for older citizens should have been subordinated to the rights and wishes of the younger generation. As a matter of practicality, an older person is more likely to concede, and let someone from younger generation have his/her way in his personal life. To institutionalize that expectation is clearly against the very principle of equality and liberty in modern, constitutional democracies. Thus, to use the ‘years to live’ number to support the ‘Remain’ argument is beyond vile and vulgar. Of course, that was not the end of it. By the evening the results were out, the social media feed was full of self-serving idiots blaming senior citizens for not letting the young bullies (or as I like to call them, ‘Generation Me’) have their way. Then, Ishaan Tharoor, the privileged son of a self-indulgent poseur, who happens to be a correspondent with The Washington Post, posted this tweet. I am not too big a fan of the slippery-slope theory. Most of them propagate hysteria and paranoia. But while reading Tharoor’s tweet I could not help but remember this quote from Sir Francis Galton while promoting the idea of ‘selection’ in his theory of eugenics. Really, how different are Tharoor and Sir Galton in their fundamental thought process and what they wish/ed to accomplish? We have read how the Nazis enthusiastically embraced the notion of Darwinism and eugenics (a term coined by Sir Galton) to systematically murder over six million Jews. Make no mistake, before the common man accepts the idea of sending a human being to the gas chamber based on his ethnicity, he would have to be sold the idea of disenfranchising the condemned man first. Today, journalists like Tharoor are asking for older people’s right to vote to be taken away. The suggestion is too far-fetched, and bordering on the lunatic to be taken seriously ever, but how else do you remove people out of your way if the law does not let you do it? If the attacks on senior citizens in the UK and elsewhere in Europe go up, then the flippant remarks by journalists like Tharoor should be seen as the progenitors of the movement to disenfranchise older citizens. And if all these arguments seem too implausible for you – imagine any older members in your own family. Do you really want to disempower and weaken them? Will the editors of The Washington Post take cognizance of this barely-veiled aggression from one of their columnists and take action? Well, don’t hold your breath. I had fact-checked an articlehe newspaper had carried about increasing violence in India and instead of providing a rebuttal, their India-based correspondent, Annie Gowen, had responded with “this is an Associated Press news carried by many publications including us” defence. Also, these so-called-liberals are remarkably clever in separating personal opinions from professional ones when they wish. Therefore, when someone like Dr. Subramanian Swamy writes an op-ed suggesting that those who don’t acknowledge Indians’ Hindu ancestry be disenfranchised calls for his head go viral and Harvard removes him from his faculty position but when the likes of Tharoor suggest disenfranchising people based on their age it will be forgotten or dismissed as a mere flippant remark. As expected, the liberals in the US and the UK found stellar support from our own eminent journalists. Rajdeep Sardesai, who had declared all ‘Leave’ campaigners as ‘haters’ in a tweet on the previous day, tweeted this when the results came. One is of course a career politician who understands how democracy works, while the other is a suited, booted version of a ten-year-old walking away from the field with his bat because he was declared ‘out’. The fact that Gupta is a sore loser does not bother me. What bothers me is the subtle tone of aggression towards people who do not agree with him. Labelling your opponents as a mob/lynch mob/hooligans is an act of violence, and a weapon used to browbeat the opposition into silence, or push them into a corner to eventually justify the use of force against them. The pigs in ‘Animal Farm’ have already proclaimed that “all animals are equal but some are more equal than others” and now they are calling the others traitors. Punishment and lynching might not be far behind. Dear Liberals, we understand your feeling of hurt and disappointment over the Brexit result. It did not go your way. These things happen. Especially to the younger generation brought up in the over protected, self-esteem movement based ‘everyone is a winner’ education system, the shocking realisation that in the real world you cannot always be winners could be disconcerting. But here is the thing folks, today the reason that the so-called right is rising throughout Europe does not necessarily point at a moral decay in society. It can simply be disenchantment with the promises that the left-liberals sold but failed to deliver. If you consider your ideology as a product and its consumers as your clients, then calling clients who were won over by the competition as ‘lynch mobs’, is hardly an effective strategy to win them back over. Trust me, I have been in sales for over twenty years and I am yet to see a single client coming back to the salesperson who abused him/her. “In too many companies, the customer has become a bloody nuisance whose unpredictable behaviours damages carefully made strategic plans, whose activities mess up computer operations and who stubbornly insists that the purchased products should work”. It is not the senior citizens’ fault that they voted in their self-interest. You did that too. Trying to demonize them, or blaming the verdict on the right wing rhetoric will only further deepen the divide and solidify your cry-bully reputation. Please introspect and ask yourself why your product is not working. Abdullah Azam was speaking in reference to Yogi Adityanath's response to BSP chief Mayawati, who had appealed to Muslim voters to not vote for the Congress.